As campaigning begins in earnest at United Teachers Los Angeles (UTLA), the second-largest teachers union in the country, the election for the presidency could be as much about ideology as which candidate has more foot-soldiers. The union has shown signs of deep fracture lately, and with just 20 percent of the union’s 35,000 members expected to vote, the winner’s message will have to capture the votes of just a couple thousand teachers, in a long and drawn out process that begins on Feb. 25, and might not end until spring. At the same time, with the union facing declining enrollment and revenue, the race is set to highlight a debate raging about its role, goals and tactics: should it stick to bread and butter issues of pay and contracts, or expand its mission to tackle race and equity? How confrontational should it be? As current president of UTLA, Fletcher has both the advantages and disadvantages of the incumbency. He’s become the target of left-leaning activists who see him as too moderate and unwilling use tactics like strikes and protests. But at the first presidential candidate forum, Fletcher defended his leadership, saying that members are better off today than they were when he took office. As achievements, he pointed to furlough days being eliminated, the district’s putting a stop to annual RIF cycles, and that both Adult and Early Education were saved from complete elimination. He also pointed to the cap placed on the Public School Choice program (which allowed failing schools to be reconstituted as charters), and how he campaigned on behalf of two school board members – Steve Zimmer and Monica Ratliff – against reform backed candidates. He’s advocated for a pay hike and pressed the district to rehire teachers. In 2011, Fletcher defeated seven other candidates and prevailed in a runoff, succeeding A.J. Duffy. 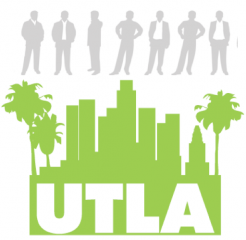 Previously he has served on UTLA’s Board of Directors and in the House of Representatives. He started with LAUSD in 1978 as a teachers’ assistant and became a classroom teacher in 1983. Well positioned as a formidable Fletcher opponent, Alex Caputo-Pearl is running at the top of a slate called “Union Power” – that includes seven colleagues running for other down-ballot positions. 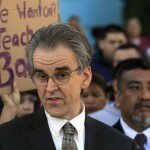 To strengthen UTLA’s leverage, Caputo-Pearl says he will develop a coalition branch and a communications department and will cultivate a team of researchers and experts “to frame the debate” on big issues like the Common Core. Now in his second term as UTLA Secondary Vice-President, Solkovits is well known figure within the union – his mother served as UTLA president starting in 1979, and he has held numerous leadership roles within UTLA. The position Solkovits is vacating to run for president will be the only open seat. Solkovits has been an LA Unified high school teacher for 28 years. A dark horse in the race, Gaffney is a moderate who talks about needing to create a productive relationship with the LA Unified district. He became involved with UTLA in 2007 after the district-wide payroll system changeover, which left thousands of teachers without a pay-check. As a parent of four children in the school district, Garcia says he favors randomly searching students for weapons and contraband. He ran for UTLA president in 2011 and received just 1.5 percent of the vote, but this year he could benefit from having drawn the top position on the ballot. Listed on the ballot as “Saul ‘the fighter’ Lankster,” he says he will negotiate a teacher pay raise in his first 18 months in office and put an end to policies that he says target well-paid teachers and land them in “teacher jail.” Now a teacher at Huntington Park High School, Lankster grew up in Alabama and, according to his website, was involved in the Civil Rights Movement and went to jail with Dr. Martin Luther King. A candidate who is focused primarily on health issues, Mottus, is a familiar face at school board meetings where he has frequently spoken out to warn of adverse health effects of wireless digital devices. Last year he presented a motion before the UTLA house of representatives to adopt a policy that would require employees be informed when there are changes in their exposure to environmental hazards including electromagnetic radiation. The motion was adopted. His platform includes a plan to restore PPO medical coverage for members and include disability insurance in union dues. Mottus is a registered coach for Attention Deficit Hyperactivity Disorder and helps children and adults with learning disabilities and dyslexia. He works as a psychiatric social worker at the School Mental Health Department at LAUSD, focusing on students with behavioral problems. A teacher who has been sitting in “teacher jail” since October for allegedly assaulting a student, Ortega has no other issue he cares more about. A labor lawyer and English teacher at Stevenson Middle School, Osunwa is one of two candidates who did not participate in the first candidate forum. 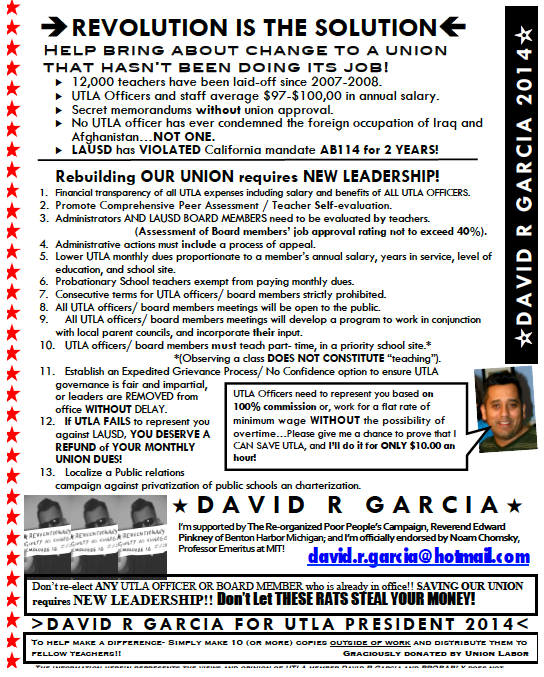 He is also a relative newcomer to the field, declaring his candidacy during the do-over filing period, which was opened by UTLA to allow potential candidates to pay their back dues to run. Osunwa has had some previous political experience although his last run for office was probably less successful than he intended. As a write-in candidate for the 32nd Congressional District in California, he lost to Democrat Hilda Solis, 130,042 to 8. A substitute teacher since 1995, Segal is one of two candidates who did not participate in the first candidate forum. He is the North Calling Area Chapter Chair on the Substitute Teachers Committee and was the NEA Substitute Teacher Caucus Chair from 2003 to 2011. This is Segal’s second bid for the presidency. He ran in 2011 receiving just over 3 percent of the vote in a field of eight. If that race is any indication, Segal might have entered the race in order to throw his support behind the candidacy of current president Warren Fletcher. 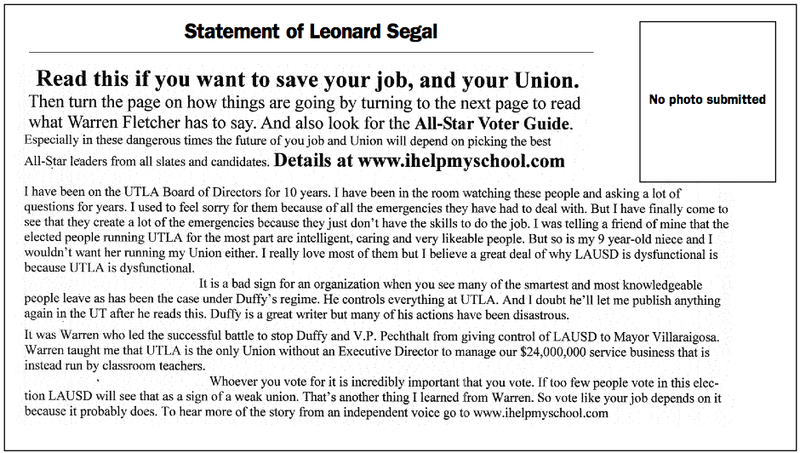 When he ran In 2011, Segal used the advertising space allotted to him in the election edition of the United Teacher to promote his competitor, or perhaps ally, Warren Fletcher.